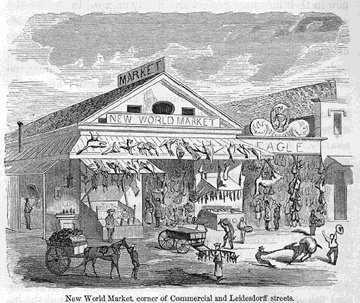 The "New World Market" at Commercial and Leidsdorf streets. The arrivals by sea at San Francisco were not so numerous in 1851 as during the preceding year. The tide of immigration was slackening, only to roll in its much greater numbers the following season. During 1851, upwards of 27,000 persons arrived by sea. Of these, rather more than one-half came by steamers from the ports on or near the Isthmus. The ordinary population of the city was increasing, though more slowly than before. At the close of this year the total number probably exceeded thirty thousand. Females were very few in proportion to the whole number of inhabitants, although they were beginning to increase more rapidly. A very large proportion of the female population continued to be of loose character. The Chinese now began to arrive in considerable bands, and occasionally a few of their females. Great numbers of French and Germans, of both sexes, as well as other foreigners, made their appearance. The immigrants generally were of the mining and agricultural classes, although a fair number of them ultimately settled in San Francisco. An extensive immigration continued among the various districts and towns of the country, and the population of all was constantly changing. Fewer fortunate miners now paid visits to the city for the sake of mere recreation, since the rising towns of the interior, particularly Sacramento and Stockton, the capitals of the northern and southern mines respectively, offered all the attractions of dissipation closer at hand. Yet in one way or another, at least one half of the entire population of the State passed through, or visited San Francisco. The ocean steamers carried away more people from the port than they brought. There was the usual large land immigration into the State, and, on the whole, the general population of the county was considerably increased. In San Francisco material improvements were taking place. At Clark's Point, on the northern extremity of the city, huge precipitous rocks were quarried and removed, and the solid hill deeply excavated, whereby much new and valuable space was gained for building operations. New streets were graded, planked and built upon, and new and finer houses everywhere erected. In the southern districts, the "steam-paddy" had been set to work, and was rapidly cutting away the numerous sand hills that lay between the plaza and "Happy Valley." The rubbish was conveyed by temporary rails along the streets, and emptied into the bay at those parts where already roads were laid out and houses built on piles. Sansome and Battery, with the intersecting streets to a considerable distance, were gradually filled up, and firm foundations given for the substantial brick and stone houses that were beginning to be erected there. The town continued to move eastward, and new streets were formed upon piles farther out into the bay, across which the piers and wharves were shooting like the first slender lines of ice before the sheet of water hardens into a solid mass. Closer and thicker the lines ran, as house after house was reared on innumerable piles, while the steam-paddy and railway wagons, and horse-carts without number, were incessantly bearing hills of sand piecemeal to fill up the hollows, and drive the sea far away from the original beach. Where once ships of a thousand tons floated there now rose great tenements of brick and mortar securely founded in the solid earth. Portions of the loose sand were insensibly washed off by the tides from the first places where it was deposited, and the bay was slowly becoming shallower to a considerable distance from shore. As the wharves were pushed farther out, the shipping found less convenient anchorage, and were exposed to occasional strong tides and gales. The character of the port was perhaps changing somewhat for the worse, although the necessities of the town so far urgently required an extension across the bay. The fires of 1850 and 1851, while they destroyed much valuable property, led in the end to a very superior kind of building--and may thus be said to have done some permanent good. They have stamped a wonderfully grand character upon the architecture of the place. What at first were called and believed to be fire-proof houses were becoming numerous, when successive conflagrations came and removed them all. Other houses were built of a still more substantial kind, and these were destroyed by fire in turn. At last some buildings were erected that surely were proof against the most intense heat and flame; and upon their models all the later structures of pretension have been formed. While in certain respects these buildings assume the proportions and grandeur of palaces, in others they appear heavy and gloomy like the veriest prisons. The walls are enormously thick, and the windows deeply sunk in them, showing often at first sight only narrow, dark cavities. When the ponderous wrought iron shutters and doors are closed on the outside the resemblance to a jail is complete. It is believed that no fire from without can seriously affect such buildings, although they may be subject to internal conflagration. While improved houses were rising in the centre and business portion of the town, superior buildings of frame were replacing, in the outskirts and suburbs the old habitations, or such as were destroyed by fire. The new plank road to the mission had opened up a large and valuable tract of building ground, and neat and substantial wooden houses were being erected along the whole way. In the vicinity of the town, wherever a tiny fertilizing stream of water ran among the sand hills, at the mission and the presidio, numerous flower and kitchen gardens and small farms were laid out, which yielded large supplies of the more necessary or prized vegetables. In 1849, the announcement of a real cabbage at dinner would have set half the population frantic with strangely stirred appetites; now, the many cultivated spots named, daily furnished numerous loaded carts of all kinds of fresh vegetables to the city markets. Potatoes were no longer a rarity; turnips could be had for money--and at a moderate price, too. The markets made pleasant morning sights. Besides a profusion of vegetables and fruits, they were largely supplied with noble fish and game of all descriptions from the ocean, the bay and the interior. Salmon of huge dimensions, and vast quantities of like delicious fish, whole cart loads of geese, ducks, quails, and other wild fowl, innumerable quarters of bear, elk, antelope, deer, and smaller game, loaded the stalls of the dealers. Mutton was perhaps not so plentiful, but excellent beef was in abundance. Times had changed with San Francisco. The hardships and semi-starvation of 1849 were forgotten in these ample supplies of exquisite food. The epicure might traverse the globe, and have no finer living than what this city yielded; the glutton would here find both eye and palate satiated. But two years had sufficed to this astonishing change. The fires that cleared the ground and rendered necessary new building operations, and the improved style of house structures, gave constant employment to everybody who could and would work. Wages therefore continued high, and the poorest of the laboring classes were enjoying the incomes of merchants and professional men of other countries. The general improvements in the aspect of the town and social character of the people, noticed in the review of 1850 were still going on. New "Expresses" were hurrying to all points; stage coaches, mails and noble steamers communicated with the most distant quarters. Additional manufactories and stores, additional newspapers, theatres, public institutions, benevolent, useful and agreeable associations, were being constantly established. Schools and churches were springing up on all sides. A certain class largely patronized the last though it must be admitted that very many, particularly foreigners, never entered them. The old life and bustle continued, though matters were now systematized, and offered less show and confusion. In 1849, San Francisco was like a great anthill, when its busy creatures happen to be disturbed, and when all were visible, hurrying to and fro, out and in, backwards apparently in the most admirable confusion and forwards and cross purposes, as if every one were engaged in some life and death struggle. In 1851, the city was like the same ant-hill when the cause of fright had been removed and order restored. The old tenants were still as busy as ever, but there was method now in their actions. Some were closely engaged in the interior--the cells or houses of the place--and made no show. Outside lines of other eager workers ran here and there, without jostling or confusion, all filled with the thought of what they had to do, and doing it well and quickly. There was no sauntering, no idleness, no dreaming. All was practical and real; all energy, perseverance and success. In business and in pleasure, the San Franciscans were fast folk; none were faster in the world. Their rents, interest on money, doings and profits, were all calculated monthly. A month with them was considered equal to a year with other people. In the former short time, men did such deeds, and saw, felt, thought, suffered and enjoyed, as much as would have lasted over a twelvemonth in other lands. But then these were really men--giants rather--the very choice of the cleverest, most adventurous and hard-working people of America and Europe. California was a hot-bed that brought humanity to a rapid, monstrous maturity, like the mammoth vegetables for which it is so celebrated.